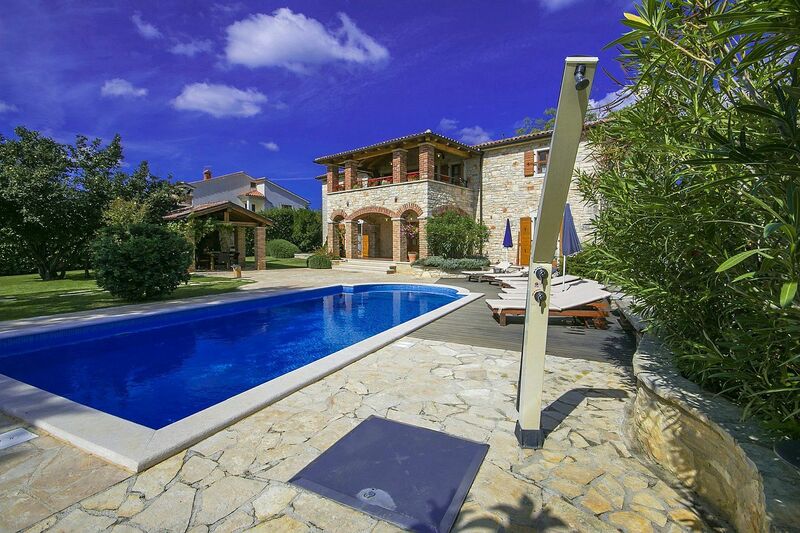 This authentic Istrian stone house is located in the village of Baderna, 15 km away from Poreč and its lovely beaches. The house was built at the beginning of the 20th century and was completely renovated in authentic Istrian style in 2008, representing a successful combination between comfort and the unique atmosphere of a traditional istrian stone house. The Villa Baderna has a garden of 1000 sqm with a lovely lawn and an oak tree over hundred years old, 32 sqm swimming pool, terrace with fireplace for barbecue and private parking places. Villa for 8 people with a total of 200 sqm. On the ground floor there's a completely equipped kitchen-dining room with table for 8 people, living room with couch and chairs, open fireplace, satellite TV and DVD-player, one double bedroom with two single beds and exit to the swimming pool, shower/toilet. On the first floor there are in total 3 double-bedrooms, each with own shower/toilet and air-conditioning, and two with an additional bed. Two of the bedrooms have the exit onto a spacious terrace (in Istrian dialect „baladur“) with garden furniture and a view of the pool.